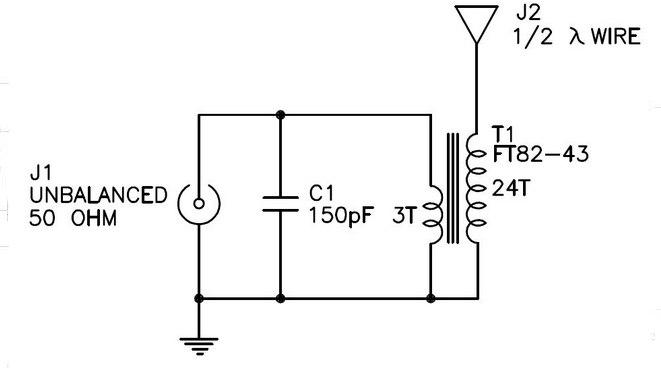 The transformer is wound as an autotransformer, 3+21 turns, ie 1:8 turns ratio. 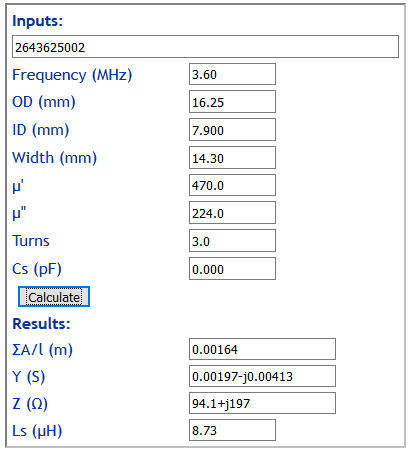 Firstly, lets estimate at 3.6MHz minimum number of turns to ensure that magnetising conductance is less than about 0.002S (for better than 90% core efficiency). 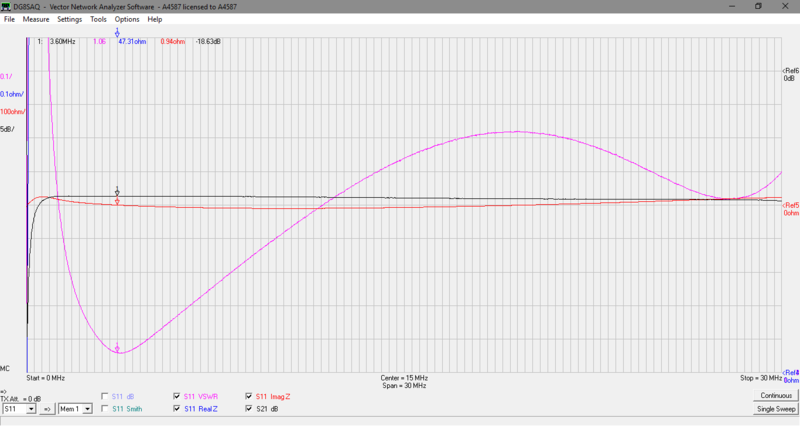 Above, 3t on the primary delivers Gcore<0.002S. 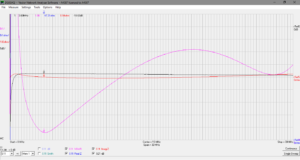 Above is a sweep of the uncompensated prototype with a 3220+50Ω load. 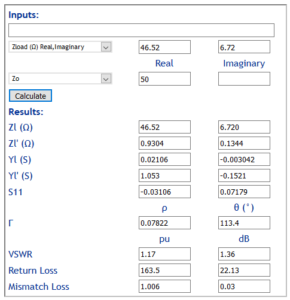 Let work through a loss analysis. 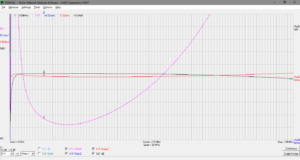 Because of the division of power between the 3220Ω resistor and VNA input, there is effectively an attenuator of -10*log(50/(50+3220))=18.16dB, so |S21| has a component due to this division. 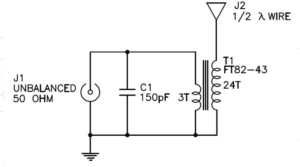 Lets call this element the LoadAttenuator. Zin=46.52+j6.72Ω. From that we can find Mismatch Loss. 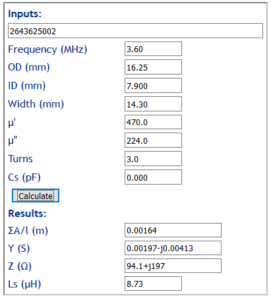 Loss (to mean PowerIn/PowerOut) can be calculated in dB as -|S21|-LoadAttenuator-MismatchLoss=–18.64-18.16-0.03=0.450dB, or an efficiency of 10^(-0.45/10)=90.2%. Note that there is some uncertainty in the measurements, but we can be confident that the loss is no where near the figure estimated for the FT82-43 design. A 100pF silvered mica was connected in shunt with the transformer primary. This is not an optimal value, benefit may be obtained by exploring small changes to that value. Above is a sweep of the roughly compensated transformer. The capacitor makes very little difference to the low frequency behavior, but it reduces the input VSWR significantly at the high end. 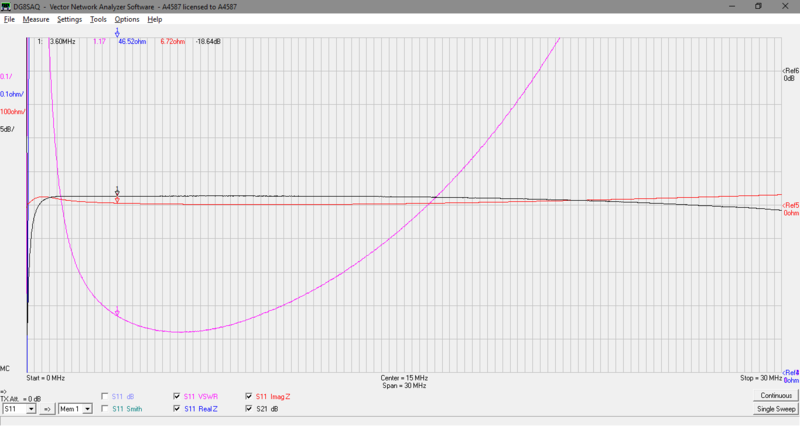 VSWR<1.8 over all of HF. 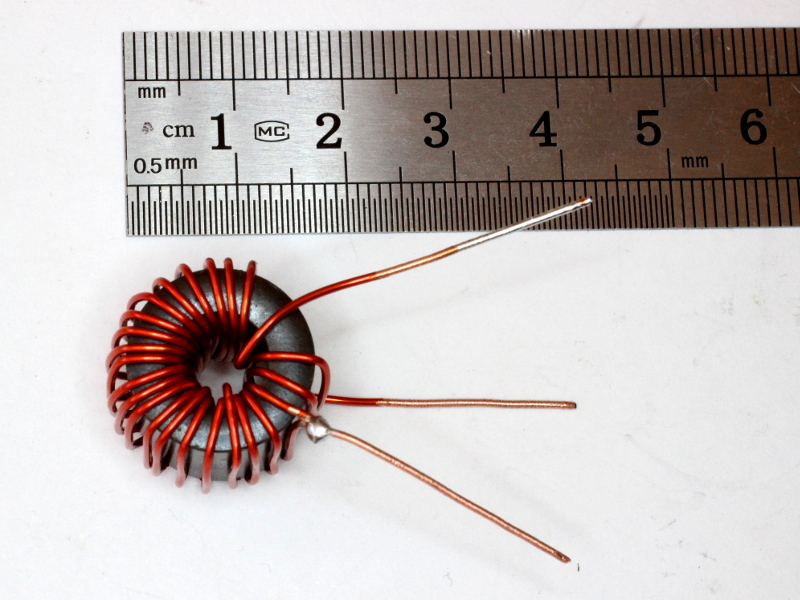 This transformer has more surface area than a FT82-43 based one, so it has higher capacity to dissipate heat, and it is more efficient, so it will have higher power capacity than the FT82-43 based one. The tests here were using a dummy load on the transformer, and that did allow confirmation of the design and expected loss at 3.6MHz. Real end fed antennas operated harmonically do not present a constant impedance, not even in harmonically related bands. Note that the resonances do not necessarily line up harmonically, there is commonly some enharmonic effect. 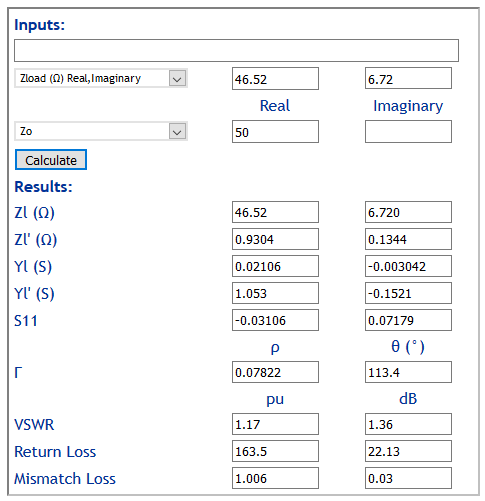 Being a more efficient design that some, it might result is a wider VSWR excursion that those others as transformer loss can serve to mask the variations in the radiator itself. Well, in ham radio, everything works. But systems that work better increase the prospects of contacts.